Assisi Heights is the motherhouse of the Sisters of St. Francis, who founded St. Mary’s Hospital, as it then was known, in 1889. The Sisters have been active with the hospital ever since, along a wide range of other ministries throughout the region, nation and world. Built in the 1950s, Assisi Heights reflects the heritage of the Umbrian region of Italy, where St. Francis of Assisi lived. The grounds – both landscaped and natural – express the Franciscan respect for the environment. Nearby Assisi Heights is a home that predates the Franciscan motherhouse. It was built by Louis Wilson, M.D. Like his better-known contemporary, Henry Plummer, M.D., Dr. Wilson was a renaissance genius in the founding generation of Mayo Clinic. His interests ranged from photography to ballistics to horticulture and education. Dr. Wilson’s wife, Maud Mellish Wilson, was the founder of the Mayo Medical Library and Mayo Clinic Proceedings, an internationally recognized medical journal. 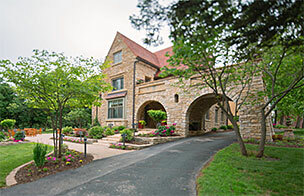 Originally called Walnut Hill and now known as the Wilson House, this residence is not open to the public, but is used for private events sponsored by Mayo Clinic and the Sisters of St. Francis.